What is a caldron and what can it be used for? 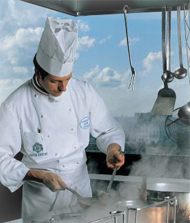 Caldron is an ancient cooking pot, which can be found in every continent, and in the culture of every nation. 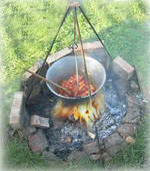 The first caldrons where used in ancient nomad cultures, because the most appropriate tool for outdoor cooking is a pot which can be hung above fire. The ancestor of today's iron caldrons where brough into the Karpatian basin by the Huns, which was made of clay then. 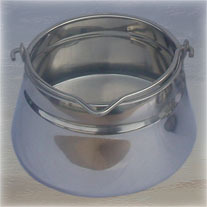 This was the most common pot in X.-XIII. centurian Hungary. Today it is closely interweaved with Hungarian culture, we might even say that it became the symbol of Hungarian gastronomy. Caldrons today mean much more than simply a type of pots made for outdoor usage. Those who once experienced the freedom and joy of caldroning outdoors will not forget it, and will come for more. This understaning has been what brought us to the conclusion of making these exclusively fine quality of caldrons to our customers --- in different types, sizes, made of different material (stainless, enamelled caldrons) and also suplementary tools (for example mounting). We wish you everlasting joyful experiences with our products.